In my practice of holistic mental health care, I encountered a number of unfortunate patients that had had one or more series of electroconvulsant (shock) “therapies” (ECT) , where a series of sub-lethal electrical shocks are administered directly to one or both hemispheres of the brain. To be regarded as “therapeutic”, enough electricity in this still very controversial procedure (often utilizing up to 400 volts) has to be given to cause a grand mal seizure, which inevitably results in post-seizure coma. Shock to the brain commonly results in memory loss (both short-term and long-term) and the loss of cognitive abilities (both short-term and long-term). General anesthesia plus intravenous sedatives are also administered in order to eliminate any memory of the otherwise painful procedure and also to relax muscles (thus minimizing muscle damage and the possibility of fractured bones during the often violent seizure). Both drugs are brain-altering and potentially brain-damaging but are routinely given. The cocktail of futile and potentially neurotoxic psychiatric drugs that may even have caused chemical brain damage are typically continued for fear of causing serious withdrawal syndromes if they were to be stopped. Labor costs account for much of the $500 – $1,000 cost for each ECT session, some or most of which is usually borne by health insurance companies. Most ECT is given in a series of 6 – 12 sessions, usually three times per week for 2 – 4 weeks. Besides the attending psychiatrist and an anesthetist or anesthesiologist, a number of other psychiatric staff, including psychiatric nurses, are present as assistants. Every one of my ECT patients had also been treated – usually for years – with high doses of a multitude of powerful, brain-altering (even brain-damaging and dementia-inducing) psychiatric drugs in a bewildering array of guess-work cocktail combinations that failed the patient or made her worse. (It is important to note that no combination of two or more psychiatric drugs has ever been thoroughly tested, short-term or long-term, for safety or efficacy – even in the experimental animal lab. Indeed, most of the trial-and-error psychiatric drug combos that my ECT patients had been given were capable of (according to the Physician’s Desk Reference [PDR]) actually causing worsening depression, lethargy and/or suicidality. So-called “treatment-resistant” depression (drug “poop-out”, drug failure or drug intoxication) and suicidality are reasons commonly given for recommending ECT. Given the multitude of exposes in the recent media concerning the high incidence of traumatic brain injuries in Iraq War veterans and NFL football players, it is important to point out that autopsy studies that have been done on patients who died following ECT show findings very similar to what is found in the autopsies done on traumatic brain injury cases and vaccine brain injuries, namely, cerebral hemorrhages (abnormal bleeding), edema (excessive accumulation of fluid), cortical atrophy (shrinkage of the cerebral cortex), fibrosis (thickening and scarring), gliosis (growth of abnormal tissue) and partially destroyed brain tissue. Consult the bibliography below for proof. ECT: Another Industry That is Too Big to Fail or Criticize? Pro-ECT insider organizations, such as the American Psychiatric Association, the AMA and the NIMH have very little oversight from unbiased observers. Indeed, they have enormous conflicts of interest. Even the pharmaceutical industry-subsidized FDA – the so-called “regulatory agency” that rules on the safety and effectiveness of drugs and medical devices – proclaims that patients might “improve” following electroshock. Of course, depending on the reporting parameters of the study, they could just be changing symptomology. These for-profit medical industries (including Big Pharma and the medical device industries like those that manufacture ECT machines and accessories) are typically the same ones that design, fund, subsidize, perform, analyze, publish and propagandize the scientific studies “proving” the safety and effectiveness of ECT. Those studies are readily published in mainstream medical journals, which are the journals that get read by average healthcare practitioners. But black-listed whistle-blowers like Breggin only get published in obscure (albeit peer-reviewed) journals that receive no advertising money from Big Pharma and other aligned entities. Of course, the insiders are subjected to essentially no oversight from unbiased observers. Interestingly, these biased industry insiders have been forced to admit that they have no idea why ECT seems to “help” the occasional patient. But the best guess as to why patients are different after ECT (ie, from the perspective of the many skeptics who doubt the heavily advertised benefits of sub-lethal electrocution to the brain) is that the memory loss, cognitive disability, post-trauma brain inflammation and the common reliance on personal care-givers (post-ECT) causes patients to ignore or forget the reasons that they entered the psychiatric system in the first place. Indeed, by the time patients get to this “Hail Mary” treatment plan, most everybody involved, especially the drugged-up and very vulnerable patient, has forgotten about 1) the (potentially curable through psychotherapy alone) temporary, decompensating, emotional crises, 2) the psych drug-induced brain intoxications, 3) the psych drug-induced withdrawal syndromes and/or 4) the ubiquitous brain malnutrition that led everybody to the conclusion that drastic measures needed to be taken. By ignoring those four common causes for the failure of “standard” treatment, it is not hard to understand why some psychiatrists throw up their hands and try the “last resort”. Practicing psychiatrist and author (called by many the “conscience of psychiatry”) Peter Breggin wrote an important article (see extended excerpts below) for the Huffington Post. In that article, Dr Breggin talks about the various aspects of the ECT industry that are profiting from electroshocking vulnerable patients. Each of them can be expected to resist reformation. There are medical journals that are entirely devoted to ECT. Physicians who are trained to perform surgery, do specialty procedures or perform other “gimmicks“ earn a lot more money than non-procedural physicians. The same is true for ECT psychiatrists, for they have incomes that are about twice as large as the average clinical psychiatrist. The anesthesiology industry profits as well. The corporations that design, market and sell expensive ECT machines are very profitable. Those machines often need regular technological upgrades, and thus new machines to replace the old ones that are now proclaimed to be obsolete or inferior. Just as happens in many for-profit corporations, there are any number of financial and professional conflicts of interest that manage to very successfully deflect and deny the strong evidence that electroshock is not good for the brain. Anybody with a little common sense will know that 400 volts of electricity can fry living tissue, especially delicate nerve tissue that can conduct electricity. Everybody understands that lightning strikes or shocks from touching a 120 volt electrical cord is capable of permanently frying skin, nerves and muscles or even stopping the heart. It doesn’t take much imagination to know what 400 volts does to the vulnerable tissues of the brain. Here is Dr Breggin’s powerful piece, which the mainstream media chose not to comment on, not wanting to disturb the peace or criticize another institution that is too big to criticize or fail. Please consult the books and papers listed in the abbreviated bibliography at the end of this column before reflexively trying to refute Breggin’s premise. Something most remarkable and unexpected has occurred in the field of psychiatry. Lead by a lifelong defender and promoter of shock treatment, Harold Sackeim, a team of investigators has recently published a follow up study of 347 patients given the currently available methods of electroshock, including the supposedly most benign forms — and confirmed that electroshock causes permanent brain damage and dysfunction. After traumatic brain damage has persisted for six months, it is likely to remain stable or even to grow worse. Therefore, the study confirms that routine clinical use of ECT causes permanent damage to the brain and its mental faculties. The term cognitive dysfunction covers the entire range of mental faculties from memory to abstract thinking and judgment. The ECT-induced persistent brain dysfunction was global. In addition to the loss of autobiographical memories, the most marked cognitive injury occurred in “retention of newly learned information,” “simple reaction time,” and most tragically “global cognitive status” or overall mental function. In other words, the patients continued to have trouble learning and remembering new things, they were slower in their mental reaction times, and they were mentally impaired across a broad range of faculties. Probably to disguise the wide swath of devastation, the Sackeim study did not provide the percentages of patients afflicted with persistent cognitive deficits; but all of the multiple tests were highly significant (p<0.0001 on 10 of 11 tests and p<0.003 on the 11th). Also, the individual measures correlated with each other. This statistical data indicates that a large percentage of patients were significantly impaired. Many patients also had persistent abnormalities on the EEGs (brain wave studies) six months after treatment, indicating even more gross underlying brain damage and dysfunction. The results confirm that the post-ECT patients, as I have described in numerous publications, were grossly brain-injured with a generalized loss of mental functions. Some of the older forms of shock — and still the most commonly used — produced the most severe damage; but all of the treatment types caused persistent brain dysfunction. The greater the number of treatments given to patients, the greater was the loss of biographical memories. Elderly women are particularly likely to get shocked — probably because there is no one to defend them — and the study found that the elderly and females were the most susceptible to severe memory loss. The study does not address the actual impact of these losses on the lives of individual patients. Like most such reports, it’s all a matter of statistics. In human reality the loss of autobiographical memories indicates that patients could no longer recall important life experiences, such as their wedding, family celebrations, graduations, vacation trips, and births and deaths. In my experience, it also includes the wiping out of significant professional experiences. I have evaluated dozens of patients whose professional and family lives have been wrecked, including a nurse who lost her career but who recently won malpractice suit against the doctor who referred her for shock. Her story is told at my website at www.breggin.com. Even when these injured people can continue to function on a superficial social basis, they nonetheless suffer devastation of their identities due to the obliteration of key aspects of their personal lives. The loss of the ability to retain and learn new material is not only humiliating and depressing but also disabling. The slowing of mental reaction time is frustrating and disabling. Even when relatively subtle, these disabilities can disrupt routine activities of living. Individuals can no longer safely drive a car for fear of losing their concentration or becoming hopelessly lost. Others can no longer find their way around their own kitchen or remember to turn off the burner on the stove. Still others cannot retain what they have just read in a newspaper or seen on television. They commonly meet old friends and new acquaintances without having any idea who they are. Ultimately, the experience of “global” cognitive dysfunction impairs the victim’s identify and sense of self, as well as ruining the overall quality of life. Although unmentioned in the Sackeim article, in addition to cognitive dysfunction, shock treatment causes severe affective or emotional disorders. Much like other victims of severe head injury, many post-shock patients become emotionally shallow and unable to relate on an intimate or spiritual level. They often become impulsive and irritable. Commonly they become chronically depressed. Having been injured by previously trusted doctors, they almost always become distrustful of all doctors and avoid even necessary medical care. This breaking scientific research has confirmed what I’ve been saying about shock treatment for thirty years. In 1979, I published Electroshock: Its Brain-Disabling Effects, the first medical book to evaluate the brain damaging and memory wrecking effects of this “treatment” for depression that requires inflicting a series of massive convulsions on the brain by means of passing a traumatic electric current through it. After many rejections, the courageous president of Springer Publishing Company, Ursula Springer, decided to publish this then controversial book. Dr. Springer told me about venomous attacks aimed at her at medical meetings as a result of her brave act in publishing my work. She never regretted it. Over the years, I have continued to write, lecture, testify in court and speak to the media about brain damage and memory loss caused by electroshock (e.g., Breggin 1991, 1992, 1997, and 1998). At times my persistence has resulted in condemnation from shock advocates such as Harold Sackeim and Max Fink whom I have criticized for systematically covering up damage done to millions of patients throughout the world. It would require too much autobiographical detail to communicate the severity of the attacks on me surrounding my criticism of ECT. It was second only to the attack on me from the drug companies for claiming that antidepressants cause violence and suicide. Given the vigor with which shock doctors have suppressed or denigrated my work, the study further surprised me by citing my 1986 scientific paper “Neuropathology and cognitive dysfunction from ECT” published in the Psychopharmacology Bulletin, noting that “critics contend that ECT invariably results in substantial and permanent memory loss.” They contrast this critical view with “some authorities,” specifically citing Max Fink and Robert Abrams, who have argued against the existence of any persistent shock effects on memory. The implication was clear that the critics were right and the so-called authorities were wrong. Sackeim was among those authorities. Fink’s “authoritative” testimony at a number of malpractice trials has enabled shock doctors to get off scot-free after damaging the brains of their patients. Abrams used to testify successfully on behalf of shock doctors until I disclosed his ownership of a shock machine manufacturing company. Unfortunately, the Sackeim group did not cite the work of neurologist John Friedberg who risked his career to criticize electroshock treatment. Nor did their article give credit to the published work of psychiatric survivor Leonard Frank or the anti-shock reform activities of the survivor moment lead by David Oaks of MindFreedom International. They also didn’t cite Colin Ross’s 2006 review and analysis showing that ECT is no more effective than sham ECT or simply sedating patients without shocking them. Will the latest confirmation of ECT-induced brain damage cause shock doctors to cut back on their use of the treatment? Not likely. Psychiatrists and their affiliated neurosurgeons always knew that lobotomy was destroying the brains and mental life of their patients but that knowledge did not daunt them one bit. It required an organized international campaign to discredit, to slow down and to almost eliminate the surgical practice of psychiatric brain mutilation in the early 1970s (Breggin and Breggin 1994). The ECT lobby is much larger and stronger than the lobotomy lobby, and much better organized, with its own journal and shock advocates positioned in high places in medicine and psychiatry. Stopping shock treatment will require public outrage, organized resistance from survivor groups and psychiatric reformers, lawsuits, and state legislation. (This essay also appeared in Dr. Breggin‘s column in the journal Ethical Human Psychology and Psychiatry, which is sponsored by the International Center for the Study of Psychiatry and Psychology (www.ICSPP.org). Breggin, P. (1991). Toxic Psychiatry: Why Therapy, Empathy, and Love Must Replace the Drugs, Electroshock, and Biochemical Theories of the “New Psychiatry”. New York: St Martin’s Press. (1992). Breggin, P. (1997). Brain-Disabling Treatments in Psychiatry: Drugs, Electroshock and the Psychopharmaceutical Complex. New York: Springer Publishing Company. Breggin, P. (1998). “Electroshock: Scientific, ethical, and political issues.” International Journal of Risk & Safety in Medicine 11, 5-40. Breggin, P. and Breggin, G. (1998). The War Against Children of Color. Monroe, Maine: Common Courage Press. Frank, L. (1978). (Ed.). 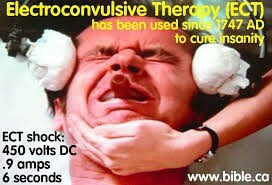 The History of Shock Treatment. Available from L. Frank, 2300 Webster Street, San Francisco, CA 94115. “Electroshock: Death, Brain Damage, Memory Loss, and Brain Washing”. Journal of Mind and Behavior, 11, 489-512. Frank, L. (2006). “The Electroshock Quotationery.” Ethical Human Psychology and Psychiatry, 8, 157-177. Friedberg, J. (1976). Electroshock is Not Good for Your Brain. San Francisco: Glide Publications. Friedberg, J. (1977). “Shock Treatment, Brain Damage, and Memory Loss: A Neurological Perspective.” American Journal of Psychiatry, 134, 1010-1014. Ross, Colin (2006). “The Sham ECT Literature: Implications for Consent to ECT.” Ethical Human Psychology and Psychiatry, 8, 17-28. Sackeim, H., Prudic, J., Fuller, R., Keilp, J., Lavori, P. and Olfson, M. (2007). “The Cognitive Effects of Electroconvulsive Therapy Community Settings.” Neuropsychopharmacology, 32, 244-254.